I've just finished my sock-knitting book! You can buy a few of the patterns separately, plus check out a few patterns for small, quick and fun things to knit or crochet. All patterns are in a PDF and will be emailed to you once your payment is made. Buy the book today! 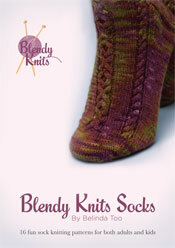 A collection of 16 socks for adults and children, with an ability level to suit all knitters. Socks don’t always have to be for winter, so here are some easy ankle socks with a feature stripe around the top and speed stripes down the sides for the kid on the go in your life. And for extra coolness, there is a pattern to make matching fingerless gloves! I was inspired to design this pattern after seeing a design on a 1960's dress. Concentration is required to knit this, but it is quite fun - the waves are easy cables and the bobbles are a novelty. I especially like the fancy cable heel. A super-cute summer project. These socks are ideal for summer sports – they are smooth on the top, and have a twisted rib sole and heel for extra support where you need it. Plus a cute picot cuff to show off in your shoes. An ideal project for left-over sock yarn as you don't need much! All patterns are sold using Paypal shopping cart. This is a really cute little imitation Santa stocking to hang on your tree, or give to someone as a gift with a tiny present inside. Use up your feathery yarn stash too! 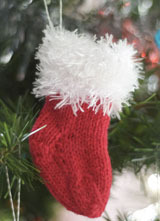 Your tree will be the best if you decorate it with cute little stockings! 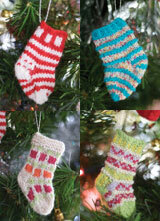 Buy all 5 patterns and go wild - these make a great little gift for anyone. This is the ultimate in eco-friendly shopping bags – it is made from cut up supermarket plastic bags! So by making it, you cleverly reduce environmental waste AND get yourself a completely awesome handbag. The pattern shows you how to make 'plarn' (PLastic yARN) before you begin your knitting. This pattern is for an amigurumi jar of Vegemite - the popular toast spread from Australia and New Zealand. Perfect if you are travelling overseas and are missing your favourite spread, or have a friend from downunder that you just can't think of a gift for - now you can make your own pretend one! Really quick to make. The jar is about 9cm (3½ inches) tall. This pattern is for a super cute amigurumi mummy dog and her tiny mischievous puppy! I used brightly coloured regular 8ply yarn. Really fun to make - even just making lots of the mini puppies would be a great stocking stuffer for all your friends! Make them in their favourite colours as keyrings perhaps. The mummy dog is about 15cm (6 inches) long from the top of the head down the length of the body, and the puppy stands about 7½cm (nearly 3 inches) tall.. This pattern is for an amigurumi bug made from rainbow yarn for the body, and brightly coloured yarn for the rest of the bug. If you didn't want to use rainbow yarn, you could leave the body plain, or maybe even stripy. I have added small bells into the front and back feet so that it jingles - this would be a great baby toy! Nice and bright with a jingly noise. The bug is about 19cm (7½ inches) long from nose-back feet. Bunnies are cute, so I decided to make a fuzzy one! This pattern is for an amigurumi bunny made from plain yarn for the head, feet and hands and feathers yarn for the fuzzy sweater. If you didn't want to use feathers, you could leave it plain. It is a bit more difficult to work with the feathers as you can't easily see the stitches or count accurately, but the good thing is that you can't see mistakes either! The bunny is about 21cm (8½ inches) tall. This pattern is for an amigurumi cool cat made from brightly coloured yarn. I haven't added a tail, but you easily could if you wanted. Really quick to make - what a great stocking stuffer for all your friends! Make them in their favourite colours. The cat is about 15cm (6 inches) long. This pattern is for a super cute amigurumi sheep! I used black and white regular 8ply yarn, and some fluffly mohair (used with a strand of white yarn) to give the wooly effect on the body. Really fun and quick to make. The sheep is about 15cm (6 inches) long. This pattern is for a super cute crochet baby poncho! Handy for cooler summer evenings, or make a winter fashion statement. I used feather yarn for the blue poncho, and a ribbon yarn for the pink poncho. Because stitch count doesn't matter for this pattern (it goes by head measurement) you could use any kind of fancy yarn (it took 1 and a half balls of 50g yarn to make each poncho). Really fun and quick to make. Perfect for birthday gifts! These two were made for 1st birthday gifts, but they would be a one-size-fits-all toddler sizing.